Magna has appointed a new marketing manager as part of its corporate team to lead on commercial development and new partnerships. Dan Tupling, who ran his own events company before moving to Magna, said: "I'm delighted to be joining Magna, and it's a really exciting time to be coming on board. "There is a lot of untapped potential on the commercial front and we are hoping to develop new partnerships which benefit the organisation." Dan, who lives in Clifton, Rotherham, will also be developing seasonal events at Magna, to rival its famous Christmas parties. 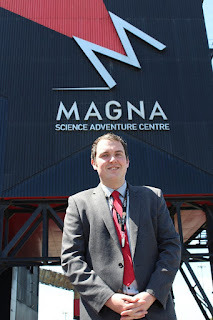 As well as being a corporate venue, Magna is an award-winning visitor attraction, with more than 100 hands-on exhibits designed to explore the four elements of air, water, earth and fire. Nearly 100,000 people enjoying the visitor attraction each year. The conference facilities were showcased on live TV this weekend with boxing promoter, Denis Hobson, putting on his second televised event at the Rotherham venue this year. Both of which have been shown live on Spike TV. This month also sees HorrorCon UK 2015 coming to Magna over two days with the aim to unite all fans of the horror genre, whether through literature, TV, film or gaming. Donna Shaw, marketing co-ordinator at Magna, said: "It's great to have a brand new convention coming to South Yorkshire, and everyone at Magna is looking forward to seeing people dressed up in what is set to be a great day. "It just shows what a versatile venue Magna is, that we can host everything from HorrorCon to business meetings and conferences." Operators have recently submitted a business plan to Rotherham Council as the venue identifies potential income opportunities that would reduce its reliance on the Council. The local authority, which is considering whether to continue to provide a £250,000 annual loan as they have done each year since 2012, has sought assurances over providing further financial support. The Council's accounts for 2014.15 show that: "A loan for £300,000 was issued to the Magna Trust in 2006/07 and of this £190,000 was still outstanding as at 31 March 2015. The Council issued to Magna a short term loan of £250,000 during 2014/15. This was outstanding as at the 31 March 2015. "Magna were provided with an additional £100,000 loan facility in January 2015. £75,000 was drawn down in respect of this facility, which was repaid in full in March 2015. In addition, an amount of £78,081 drawn down from the £80,000 facility made available within 2013/14, was also repaid in full in March 2015."